Title : Carte des Isles de Java, Sumatra Borneo &a. Les Detroits de la Sunde, Malaca, et Banca, Golfe de Siam &c. Orbis terrarum. Size : 9.7 x 11.3 inches. / 24.7 x 28.7 cm. 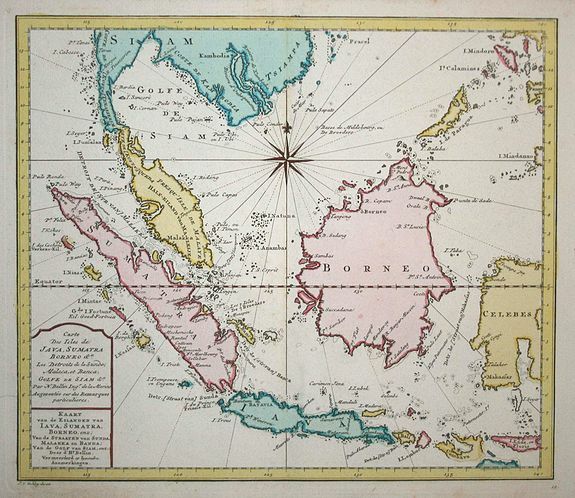 Description :This copper engraved map covers the Malaysian peninsula, Indonesia, Borneo and a portion of the Philippines. On this Dutch version, Singapore is labeled (Detr. [Str.] Singapoera). The map is very well detailed for a small format map. The cartouche includes both the French and Dutch titles.